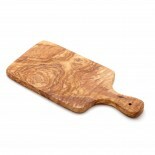 Thanks to its Mediterranean design, our NATUREHOME olive wooden chopping board is an eyecatcher in every kitchen. The upscale wood of the olive tree is antibacterial and scratchproof and therefore it is ideal for the cutting of meat, vegetables or herbs or bread– there exist a lot of application possibilities. Done by hand, the amber-colored, unique wood grain converts every wooden board into a unique specimen. The olive wood our NATUREHOME wooden chopping board is made of grows very slowly so that there results an incomparable firm and dense structure. Therefore it is predestined for the use in the kitchen since it is especially firm and does not take on paint, moisture nor odors. The wood of the olive tree we use has been air-dried gently for years so that maintaining it well, the chopping board will survive a lifetime. Thanks to the expressive grain of the wood every piece is a unique specimen.Versatile as it is, it serves as pot mat, as impervious wooden board for chopping and chaffing or also for the serving cheese or little snacks. It is easy to clean so that warm water and some dish detergent are enough to clean it. Occasionally, you should slather it with olive oil. The high quality material is not a mass product and can remain on your table during eating. You can see and feel the tender handicraft. Our NATUREHOME olive wooden chopping board is a real natural product.Measurements: 30 x 14 x 1,3 cmCare instructions: Do not put olive wooden products into the dishwasher. Preferably, sluice it with a soft sponge or cloth with a protecting cleaner and lukewarm water (water that is too hot can lead to scratches). Afterwards, wipe it, do not let it drain, and slather it with some olive oil. In doing so, the wood does not dry out and the characteristic grain and the amber color of the wood get maintained.